The mother and baby were killed after a tree fell on a house where they were staying. FOUR PEOPLE HAVE died and millions of dollars worth of damage has been caused after Storm Florence devastated the US east coast today. A mother and baby were killed when a tree fell on the house where they were staying, according to a tweet from police om Wilmington, North Carolina. Another person was killed while plugging in a generator, while a man was also knocked to the ground while outside and died, authorities said. The storm hit the US East Coast this morning with howling winds, torrential rains and life-threatening storm surges as emergency crews scrambled to rescue hundreds of people stranded in their homes by flood waters. The storm officially made landfall near Wrightsville Beach, North Carolina at 7:15am (11.15am Irish time), the National Hurricane Center said. By early afternoon, Florence’s winds had weakened to 75 mph, just barely a hurricane and well below the storm’s terrifying Category 4 peak of 140 mph earlier in the week. Ken Graham, the NHC’s director, warned the slow pace of the storm exacerbated its danger even to areas outside its immediate path. “The longer you have this hurricane wind flow, the longer you push that water well inland,” he said. New Bern Police Lieutenant David Daniels said that hundreds of people had been rescued so far, with others still waiting for help. More than 60 people were pulled from a collapsing cinderblock motel in North Carolina. In its earlier 3am Irish time advisory, the National Hurricane Center said the maximum sustained winds of Florence were 90 miles per hour, dropping it to the weakest of five categories on the Saffir-Simpson scale. But the storm still carried “very dangerous winds,” the centre added. On Wednesday, Florence was downgraded twice from its peak as a Category 4 storm which causes “catastrophic damage”. It is now at Category 1. 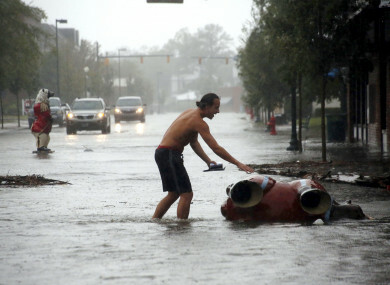 Hurricane-force winds began whipping North Carolina as federal emergency management officials warned that the hurricane remained a “very dangerous storm” capable of wreaking havoc along a wide swathe of the coast. Warning of looming storm surges of nine to 12 feet (2.7-3.6 meters), he urged residents to take the storm seriously no matter the category, saying “this is all about the water, anyway”. With winds picking up along the coastline early yesterday, federal and state officials had issued final appeals to residents to get out of the path of the “once in a lifetime” weather system. Some minor flooding was reported on the Outer Banks — barrier islands off the coast of North Carolina — and in some seaside coastal towns, as more than 110,000 power outages were reported statewide. At 3am Irish time, Florence was over the Atlantic Ocean about 60 miles (95 kilometers) east-southeast of Wilmington, North Carolina, and moving northwest at six miles per hour, the NHC said. Steve Goldstein of the National Oceanic and Atmospheric Administration said Florence’s forward motion had slowed and it was not expected to make landfall in the Carolinas until “some time Friday afternoon, Friday evening or Saturday morning”. Email “Mother and baby among four dead as Storm Florence batters US East Coast”. Feedback on “Mother and baby among four dead as Storm Florence batters US East Coast”.